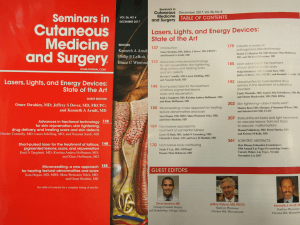 Hot off the press is the latest quarterly issue of Seminars and Cutaneous Medicine and Surgery on “Lasers, Lights and Energy Devices: State of the Art”. SkinCare Physicians’ Drs. Kenneth Arndt and Jeffrey Dover, guest editors along with Dr. Omer Ibrahim, are so pleased to see so many of our former fellows and two upcoming ones contribute their expertise to this issue. Congratulations to Drs. Omer Ibrahim, Shilpi Khetarpal, MD, Nicole Y Lee, Deanne Mraz Robinson, Nazanin Saedi, Mara Weinstein Velez, Sara Hogan and Daniel J Callaghan. Enjoy this issue which is available online with open-access until the end of 2017.